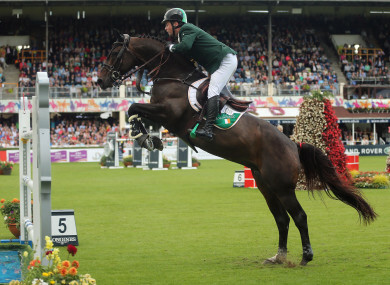 Cian O'Connor on Good Luck at the Dublin Horse Show this year. TEAM IRELAND HAVE won the gold medal at the European Championships in Gothenburg this evening. Shane Sweetnam, Cian O’Connor and Denis Lynch flew the flag in the final stage of the team competition and beat off stiff competition to claim Ireland’s first gold medal at the Europeans since 2001. Teammate Bertram Allen was also involved, but was retired after a fall in the second round. Cork native Sweetnam was the first of the remaining trio to jump, and a clear round from Tipperary-born Denhis Lynch had Ireland in the silver medal position. Cian O’Connor, aboard ‘Good Luck’ then followed suit with a clear round and saw Ireland claim the top prize on a team total of 12.11 points. Rodrigo Pessoa is their team manager. Host nation Sweden and Switzerland claimed silver and bronze respectively. Email “Huge night as Ireland win team gold at the European Championships”. Feedback on “Huge night as Ireland win team gold at the European Championships”.